Accelerate Your Mojo: 7 Steps to Ignite Your Intuition, Shake off Fear and Unleash the Real You. Allison Sutter, M.Ed., is a best selling author and contemporary spiritual teacher. She is well known for her ability to seamlessly blend spirituality and practical self-help information making it relevant to daily life. Her forthcoming book Accelerate Your Mojo: 7 Steps to Ignite Your Intuition, Shake off Fear and Unleash the Real You, published by Motivational Press, is due out in the fall of 2016. Allison’s elearning courses currently serve students in eighteen countries. She resides with her husband and three girls in Chicago. You’re not doomed to repeat the past or hardwired to play out certain painful drama. The good life is not reserved for a select few. A new idea has surfaced in self-help which states: you create your own reality … and here’s how. 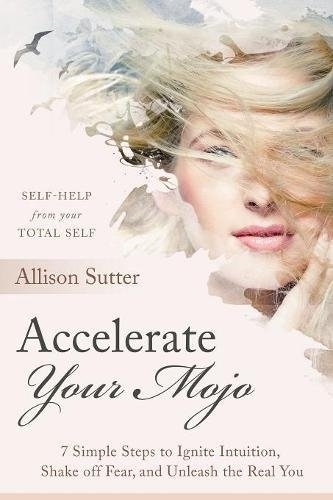 A masterful blend of logic and spirituality, Accelerate Your Mojo walks you through a step by step process uniquely designed to ignite intuition, transform fear into ease and inspire your authentic self to rise up from within and be celebrated. self-help from your total self. It has never been easier than now, as science and spirituality merge, to get to the root cause of why you do what you do—changing what isn’t working—so you can truly thrive.